Hi guys! 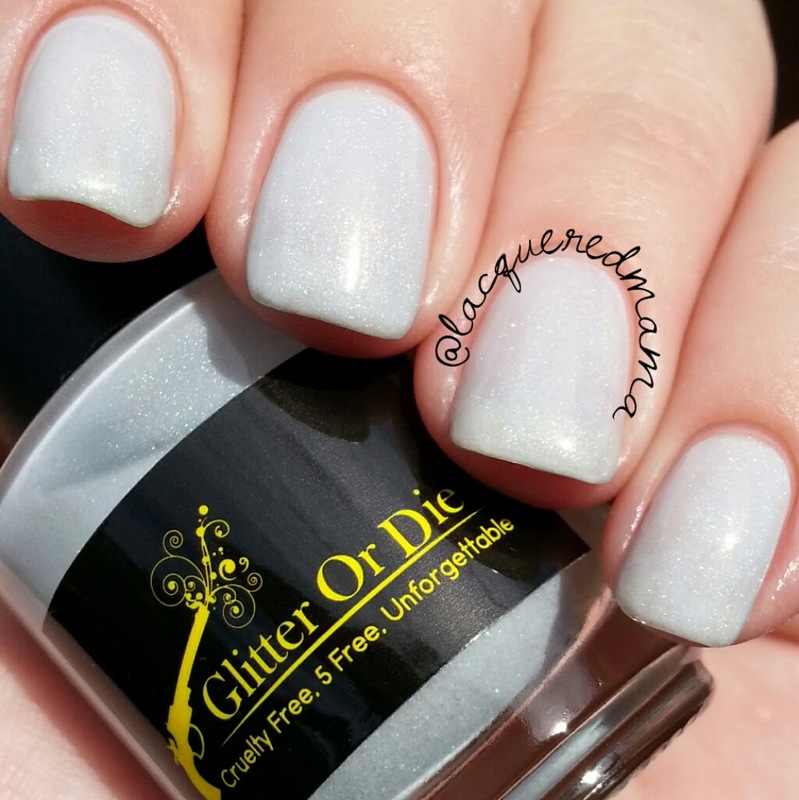 Today I have Glitter Or Die's winter collection, as well as some collab project awesomeness that she's done with Wenchness and I,A.M...CustomColor! 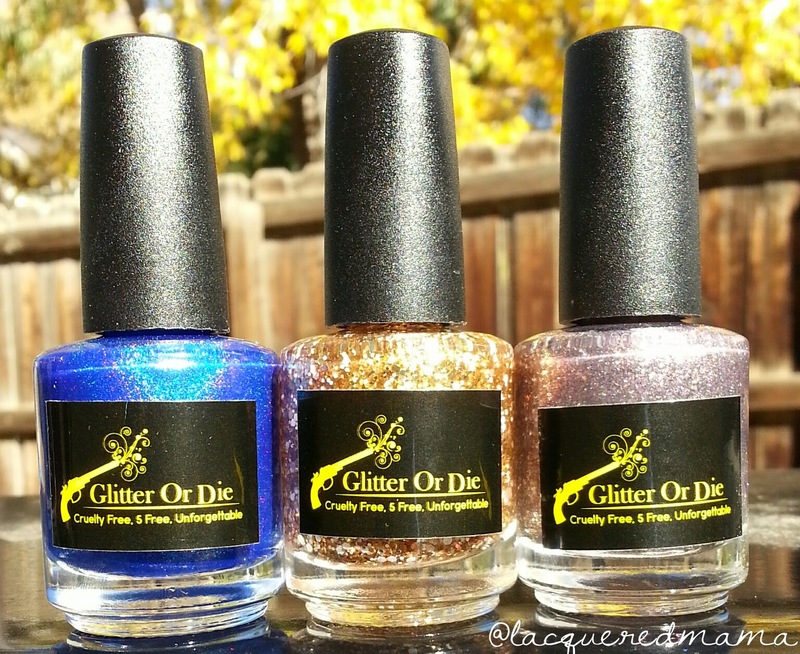 Winter 2014 Collection, "My Three Kings"
Freddie, named for Freddie Mercury, is a mega glitter bomb! 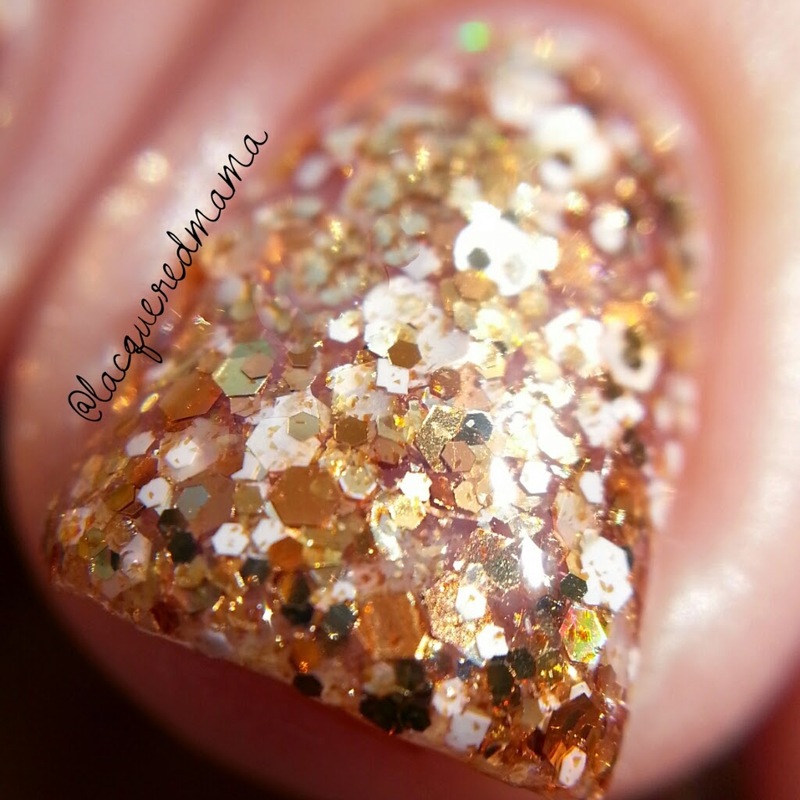 It is a clear jelly base jam packed with shades of gold, copper and white glitters and is ahhhmazing! I love this so much! 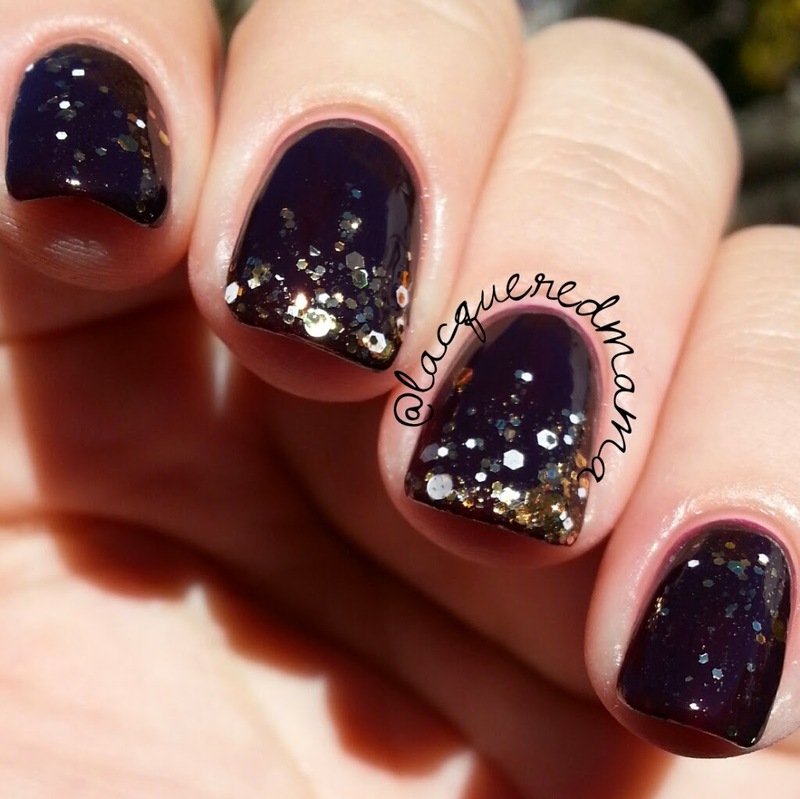 I have quite a few gold glitter toppers, but nothing like this. 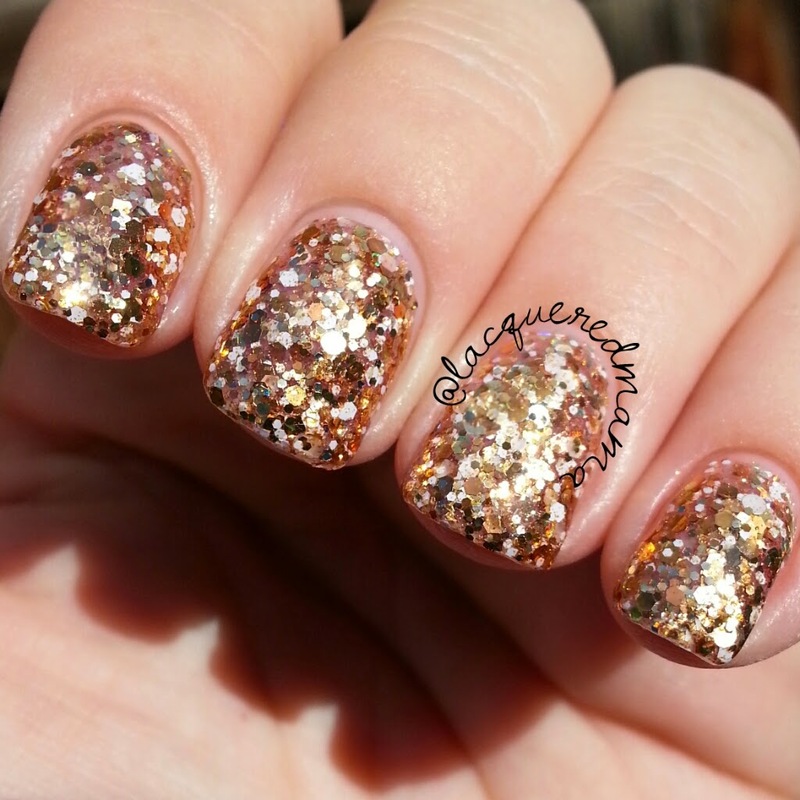 The mix of gold and tones of copper is pretty enough, but the addition of the white glitter really sets this one apart and makes is special! 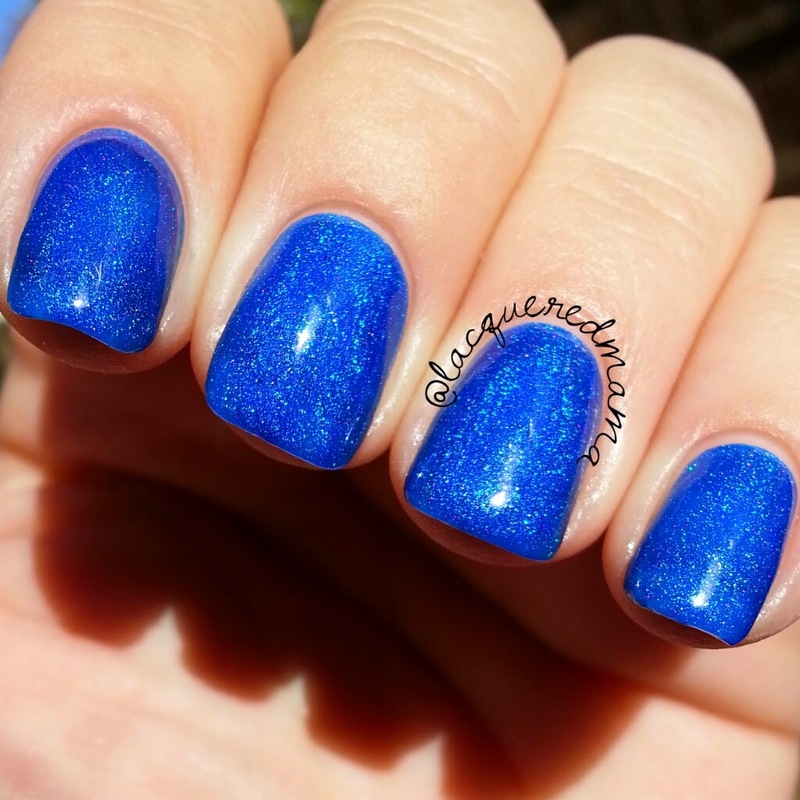 You can wear this alone in 2-3 coats or as a great topper with just 1 coat over any base color. I first applied this alone in 1 brushed on coat and then 1 dabbed on coat; then 1coat over (pinky and index) and 1 coat dabbed into a gradient (ring and middle) over Littlenailgirl Lacquer's Harley! Gah! Gorgeous! 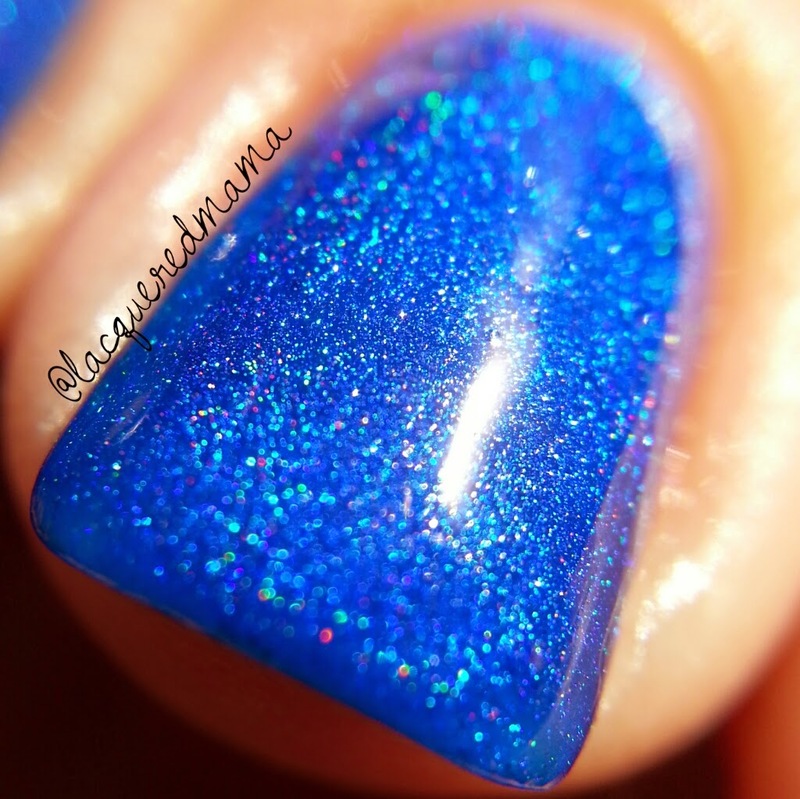 David, named for David Bowie, is a really bright and super pigmented blue holo! It is so pretty! 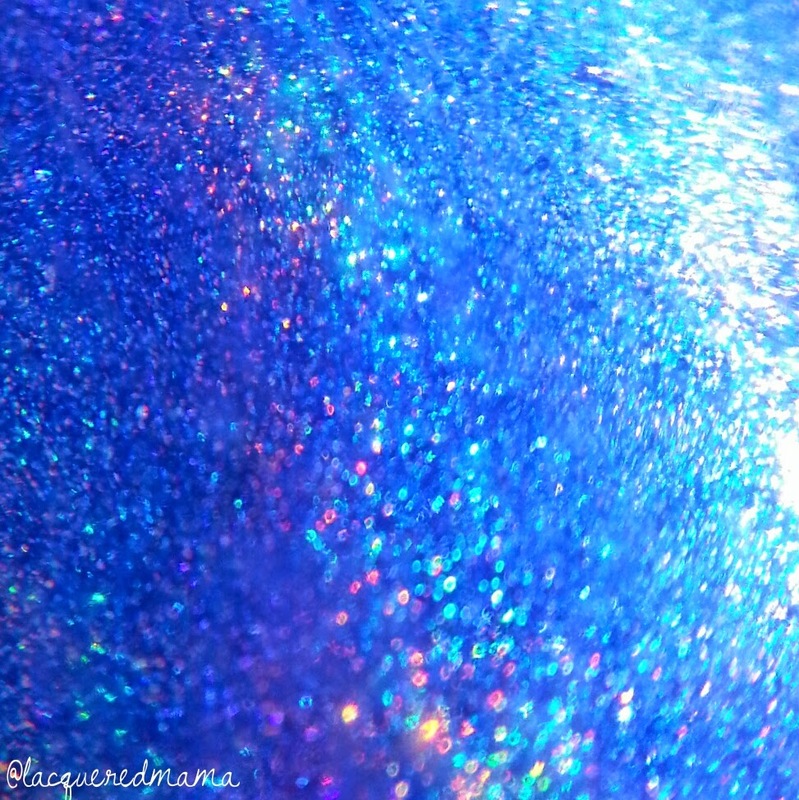 The color is absolutely gorgeous and the holo sparkles like crazy! The formula was excellent and is perfectly capable of being a 1 coater! I did 2 coats, but as I've said in other reviews, I'm a tad obsessive..haha! 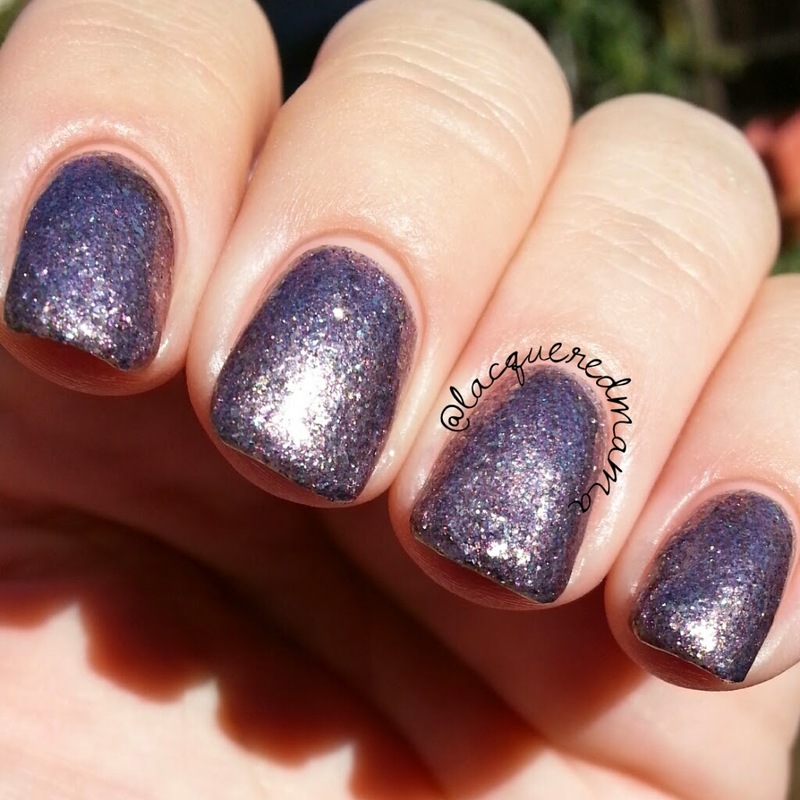 Bono, named for U2's lead singer Bono, is a beautiful, full coverage, dusty purple glitter with some flakie goodness!! 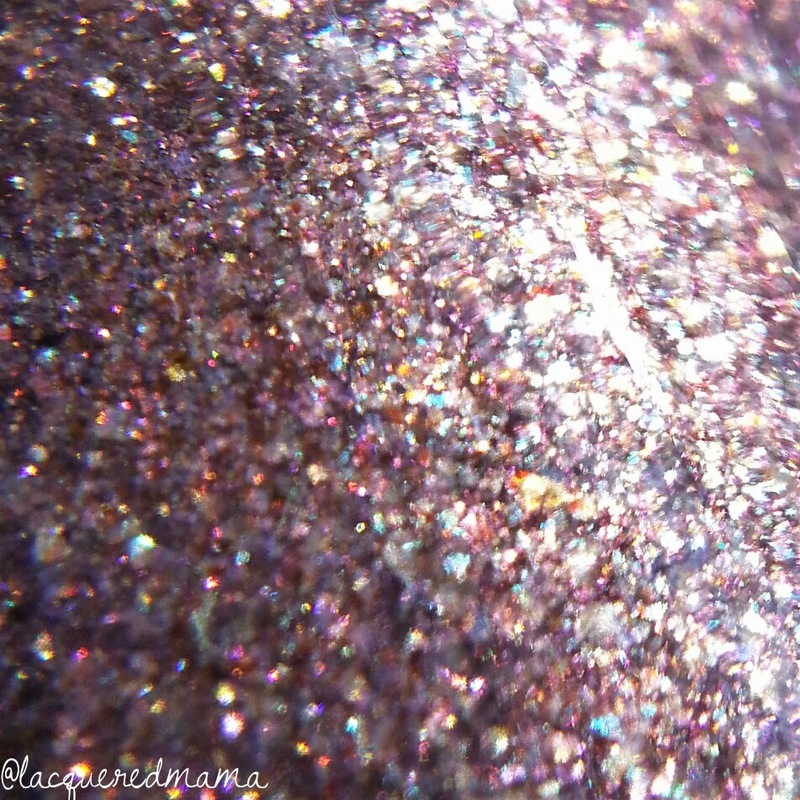 I love full coverage glitters! This actually looks pretty awesome without a topcoat; it gives that textured polish appearance, but I did add it for my photos. 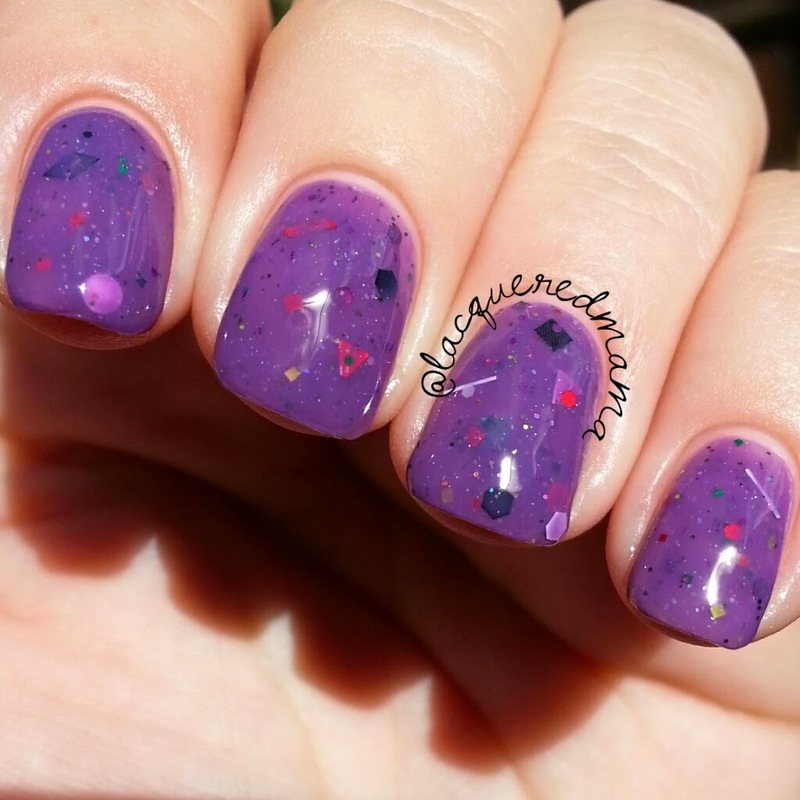 I only applied 2 coats plus the topcoat! 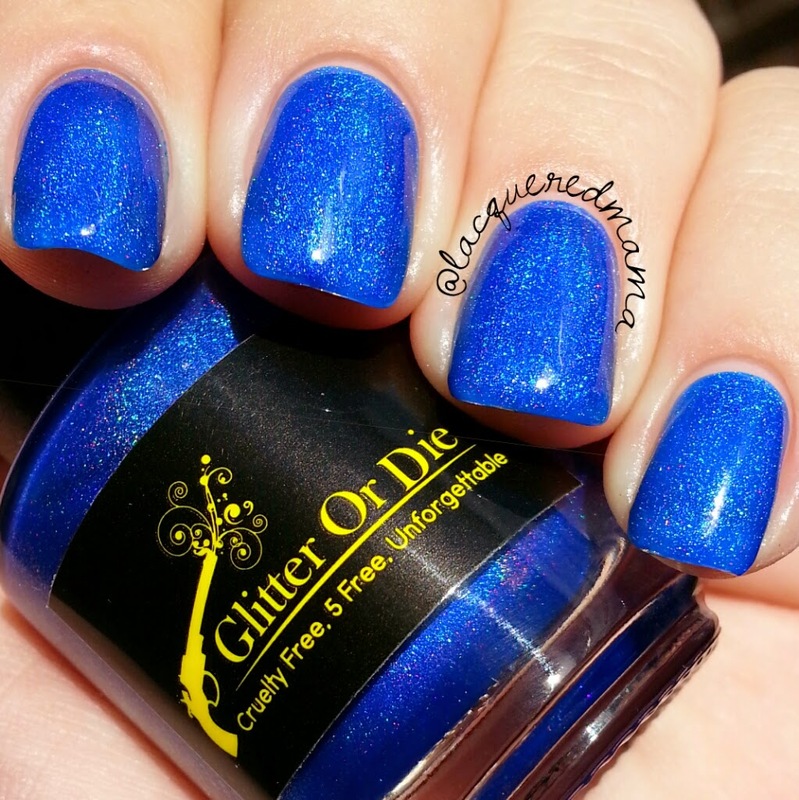 This color is marvelous! 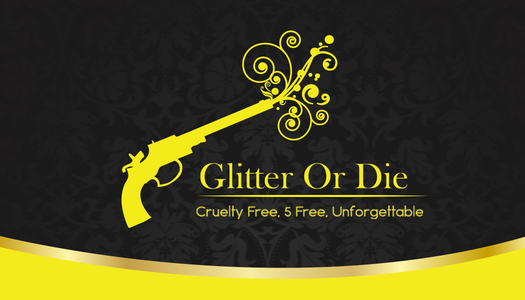 White Elephant is an ongoing collaborative project, brought to you by Wenchness and Glitter Or Die. 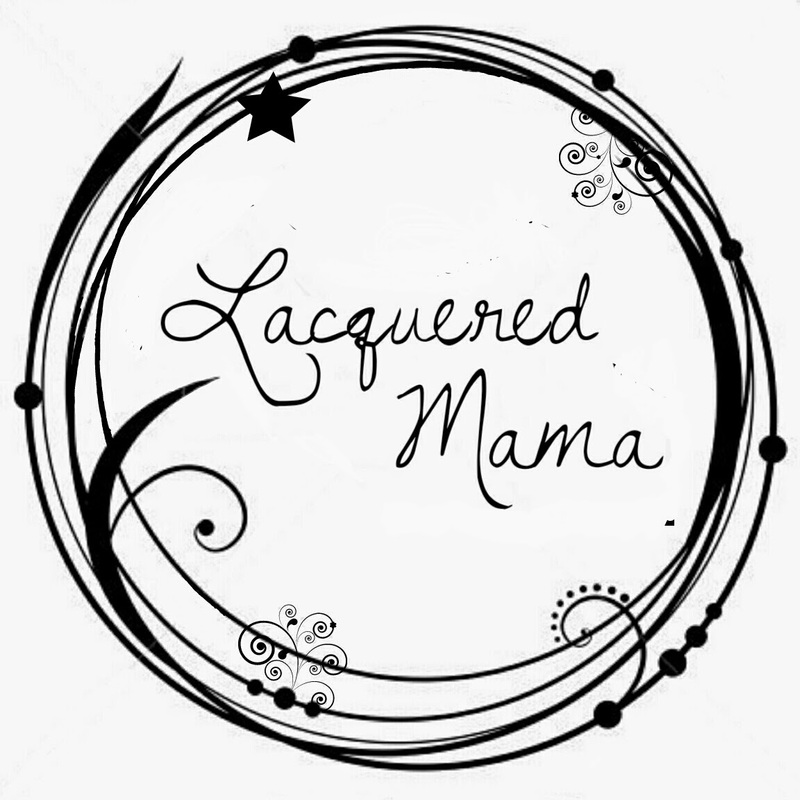 One incredible muse and one fabulous indie maker coming together to bring you pop culture based duos. Each duo will be limited edition, and only sold in sets. Just like pop icons, these will never be duplicated. The first set is called #3llamas1elephant and is inspired by the movie, Nightmare Before Christmas. They wanted the polishes to reflect the Christmas side of the movie, as well as make it a winter duo. The amazing, I,A.M...CustomColor, adores this movie; so they've decided to make it an extra special double collab! 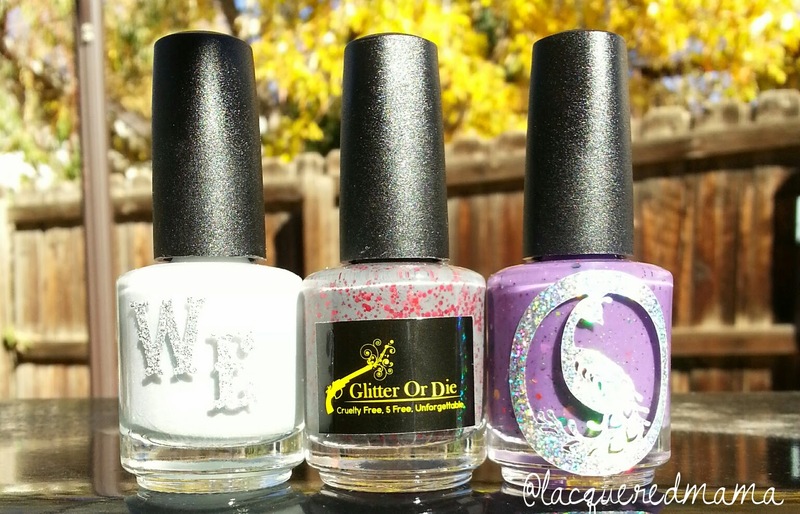 There will be 5 trios sold in both Glitter Or Die's and in I,A.M...CustomColor's shop...and once they are gone...they are GONE! 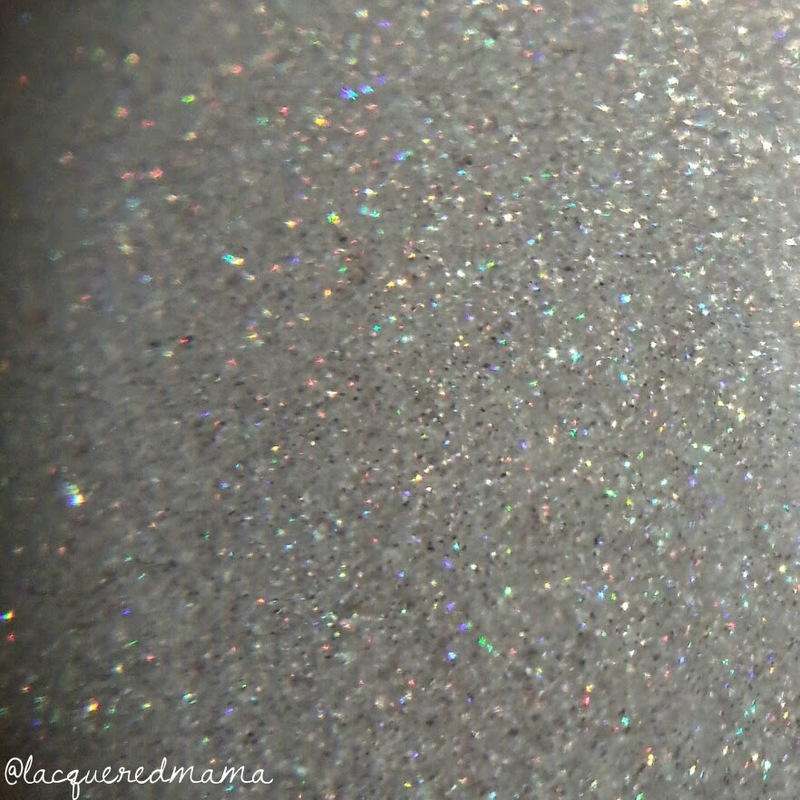 Oogie Boogie is lovely white/light gray holo with a slight teal green sheen when the light hits it just right! So gorgeous! The formula was amazing and is right on the edge of being a 1 coater. I had some slight bald spots with the first coat, so I added 1 additional plus top coat! 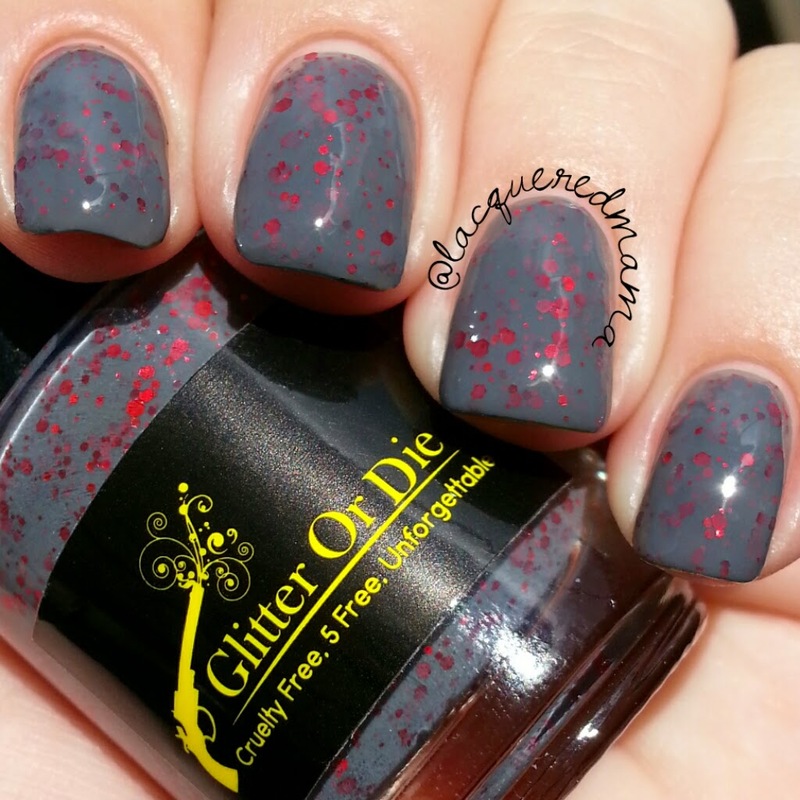 Sandy Claws is an amazing dark gray creme filled with red metallic glitters! 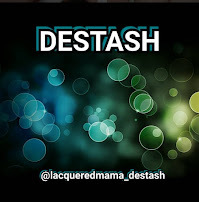 It is so awesome! 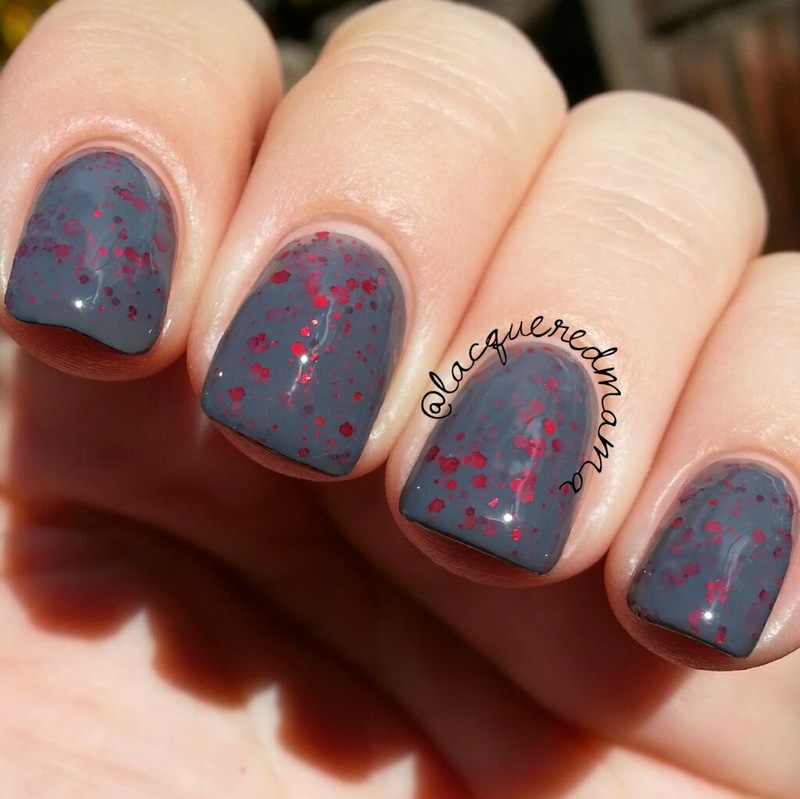 I really like gray polishes with pink glitters, but I absolutely love grays with red! 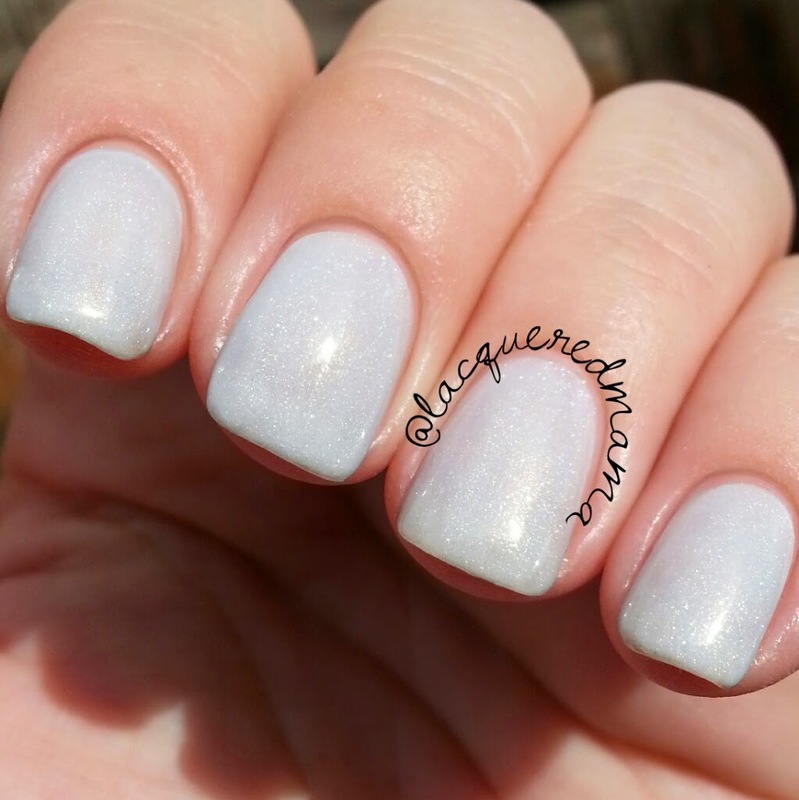 This had a perfect formula and was opaque in just 2 coats. 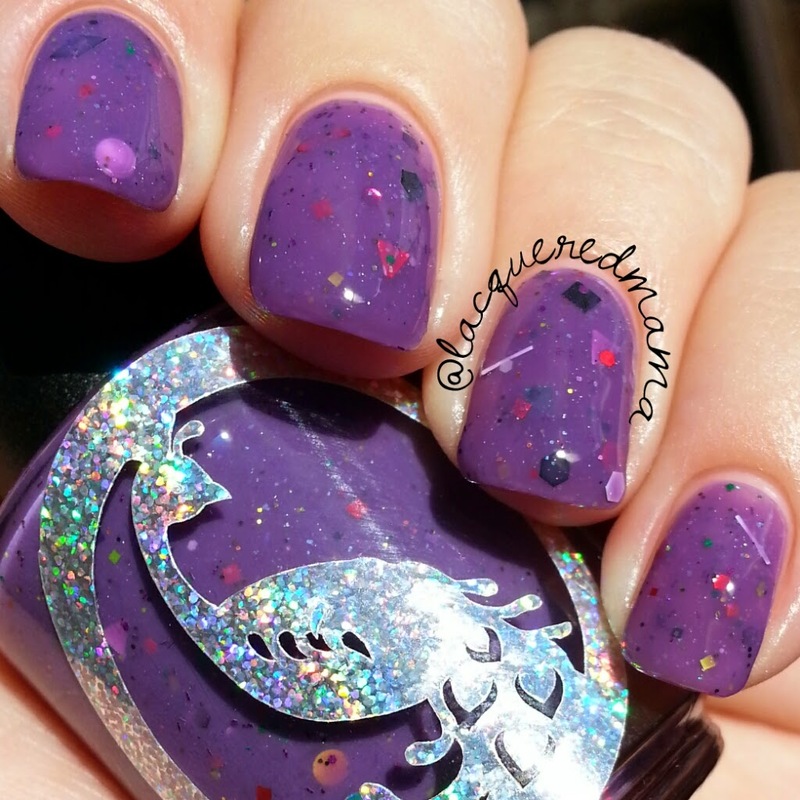 Lock, Shock & Barrel is a collab polish between Wenchness and I,A.M...CustomColor that has awesomely been created to make this a double collab! 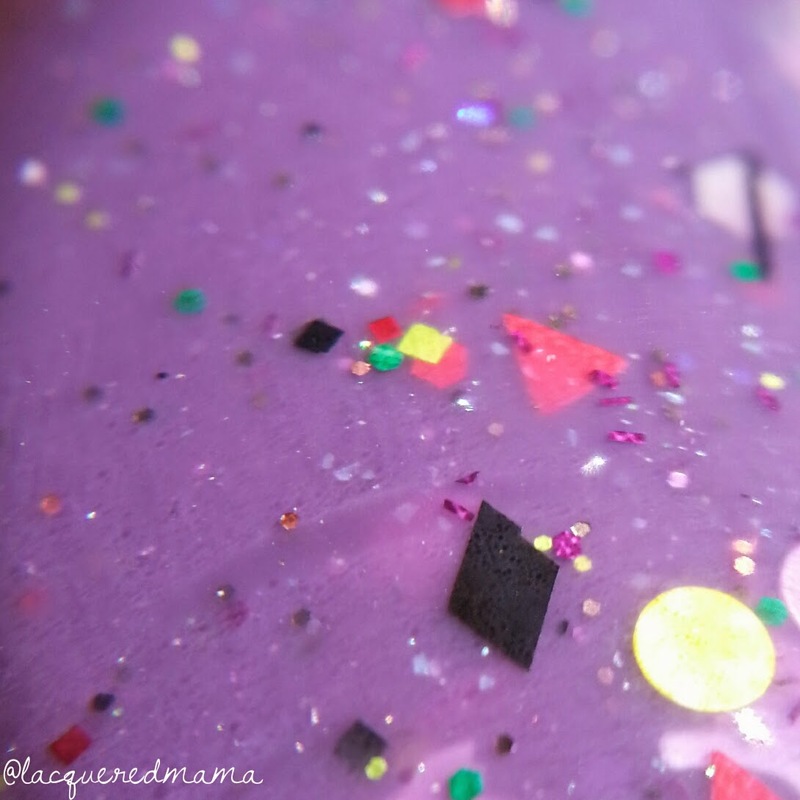 Its a beautiful purple jelly filled with triangles, circles, hexes, squares and bar glitters of varying colors; all going really well together. 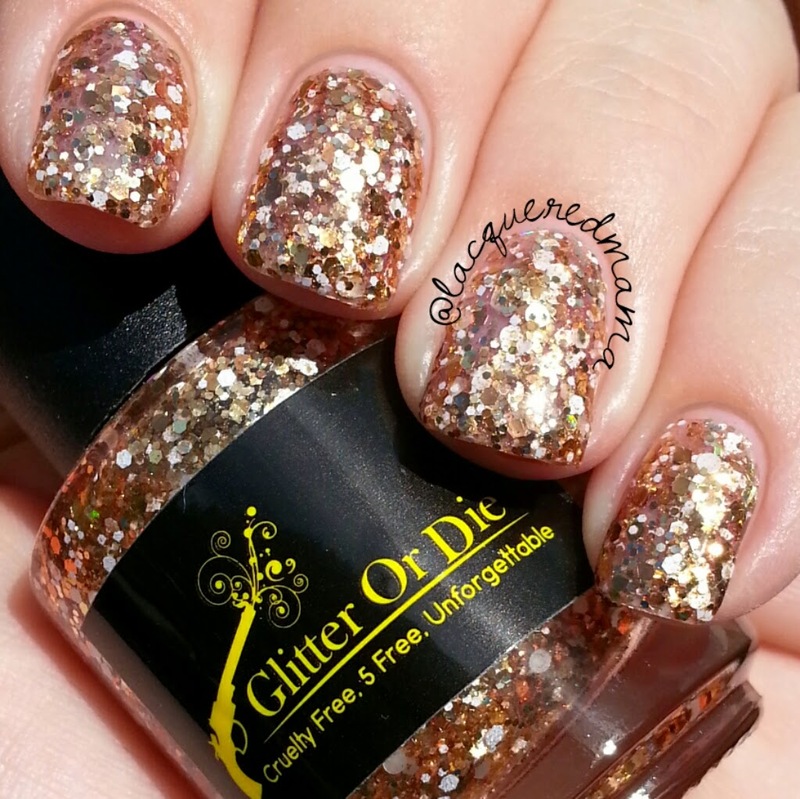 This also has just a touch of microglitter throughout. 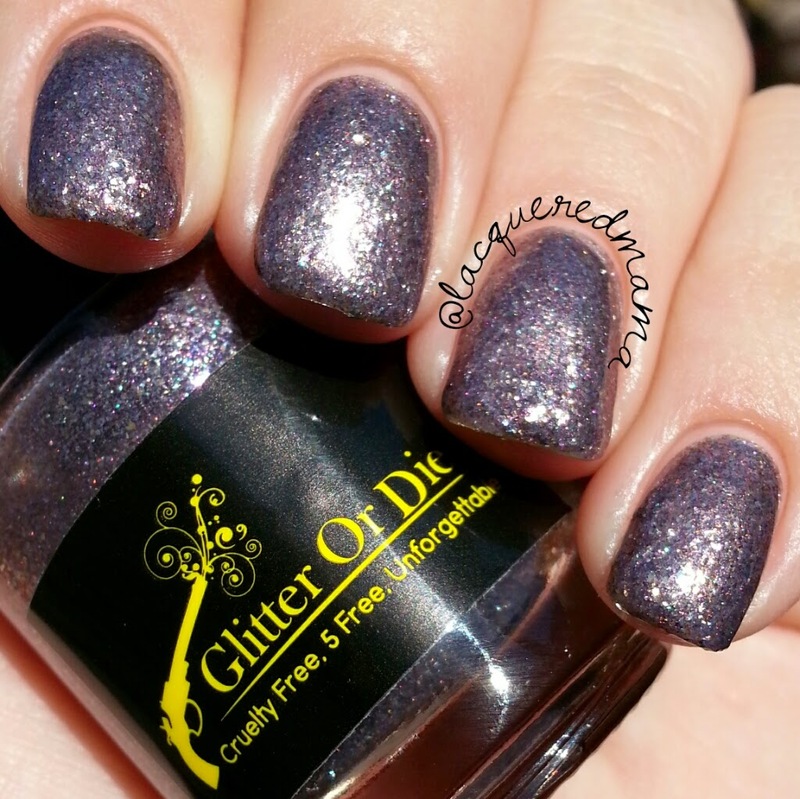 Great jelly formula that applied effortlessly, just be sure to place your bottle upside for about 5 minutes prior to applying to help bring the larger glitters back to the top. 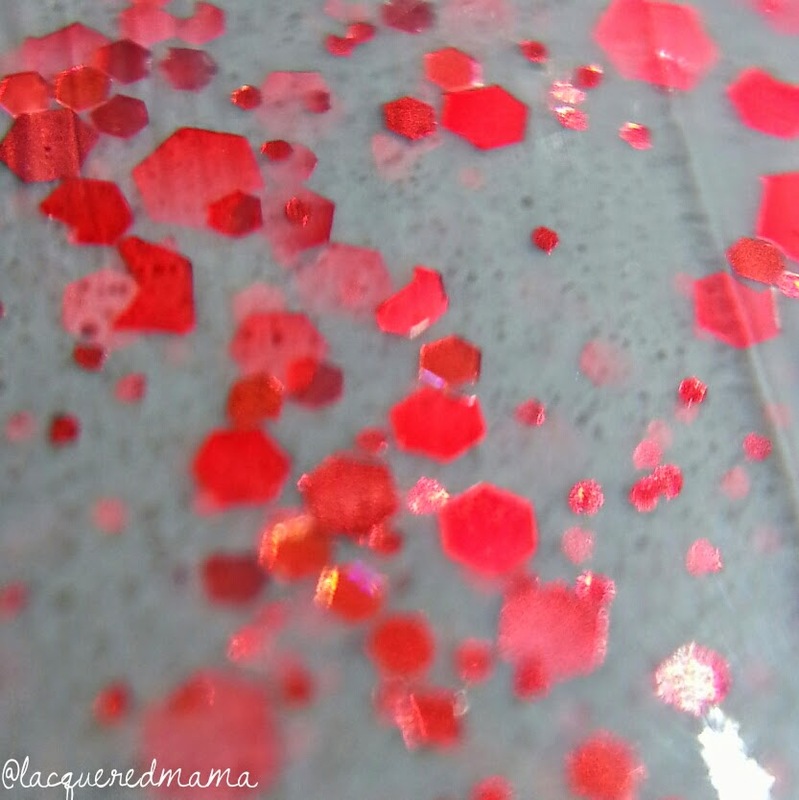 Each polish had a great formula and the colors were amazing! Perfect for the holidays, without being too season-specific that you will be able to wear these anytime. My personal fave was Freddie. 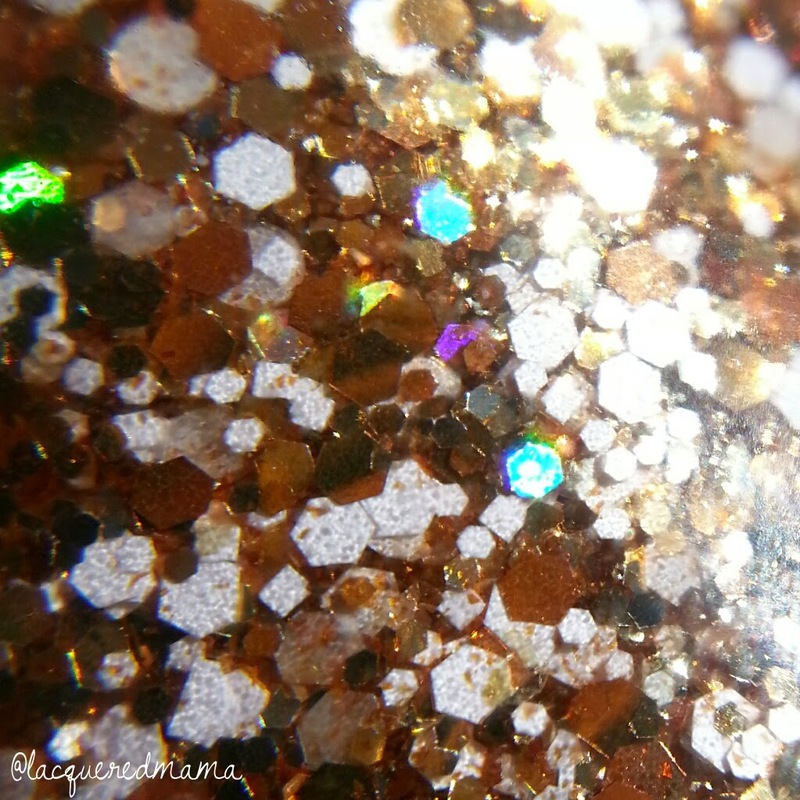 One of the most unique "golden" glitter toppers I've ever had. As for the #3llamas1elephant, they were each so beautiful, but my personal fav was Sandy Claws. Could be the gray and red combo or it could be the name that got me..haha! Either way...awesome! 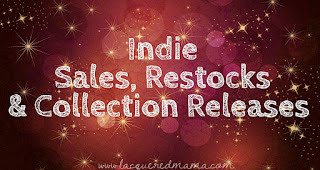 Be sure to check out Glitter Or Die, Wenchness and I,A.M...CustomColor's pages/shops for release updates and more freaking amazing polishes! Find out latest dress design Online at Smartbazar.pk. SmartBazar is an online shopping store to shop your favorite dresses online in Pakistan with free home delivery. i really liked your wide variety of winter collection regarding online shopping in pakistan. keep up the good work guys. thumbs up!